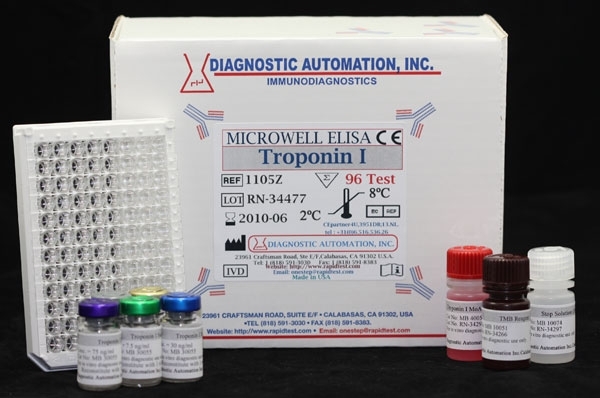 Diagnostic Automation Inc. offers a Troponin I ELISA kit which is an Enzyme Immunoassay for the quantitative determination of Cardiac-Specific Troponin I in human serum. 1. Mouse monoclonal anti-TnI Antibody-Coated Microtiter wells. 0, 2.0, 7.5, 30, and 75ng/ml of TnI, lyophilized. Troponin is the inhibitory or contractile regulating protein complex of striated muscle. It is located periodically along the thin filament of the muscle and consists of three distinct proteins: troponin I, troponin C, and troponin T. The troponin I subunit exists in three separate isoforms; two in fast-twitch and slow-twitch skeletal muscle fibers, and one in cardiac muscle. The cardiac isoform (cTnI) is about 40% dissimilar. Antibodies made against this cardiac isoform are immunologically different from antibodies made against the other two skeletal isoforms, and the unique isoform and tissue specificity of cardiac troponin I is the basis for its use as an aid in the diagnosis of acute myocardial infarction (AMI). The cardiac troponins exhibit myocardial tissue specificity and high sensitivity. Cardiac TnI and CK-MB have similar release patterns (4-6 hours after the onset of pain), but the level of cTnI remains elevated for a much longer period of time (6-10 days), thus providing for a longer window of detection of cardiac injury. Normal levels of cTn I in the blood are very low. After the onset of an AMI, cTnI levels increase substantially and are measurable in serum within 4 to 6 hours, with peak concentrations reached in approximately 12 to 24 hours after infarction. The fact that cTnI remains elevated in serum for a much longer period of time, added to its enhanced diagnostic sensitivity and cardiac specificity, allows for the detection of AMI much earlier after the onset of ischemia (4 hours) as well as the diagnosis of peri-operative infarction in situations where a high serum level of skeletal muscle proteins are expected. The cTnI Enzyme Immunoassay provides a rapid, sensitive, and reliable assay for the quantitative measurement of cardiac-specific troponin I. The antibodies developed for the test will determine a minimal concentration of 1.0ng/ml, and there is no cross-reactivity with human cardiac troponin skeletal troponin T or I. The cTnI ELISA test is based on the principle of a solid phase enzyme-linked immunosorbent assay. The assay system utilizes four unique monoclonal antibodies directed against distinct antigenic determinants on the molecule. Three mouse monoclonal anti-troponin I antibodies are used for solid phase immobilization (on the microtiter wells). The fourth antibody is in the antibody-enzyme (horseradish peroxidase) conjugate solution. The Cardiac Troponin test sample is allowed to react simultaneously with the four antibodies, resulting in the troponin I molecules being sandwiched between the solid phase and enzyme-linked antibodies. After a 90-minute incubation at room temperature, the wells are washed with water to remove unbound-labeled antibodies. A solution of tetramethylbenzidine (TMB) Reagent is added and incubated for 20 minutes, resulting in the development of a blue color. The color development is stopped with the addition of 1N hydrochloric acid (HCl) changing the color to yellow. The minimum detectable concentration of the cTnI ELISA assay as measured by 2SD from the mean of a zero standard is estimated to be 1.0ng/ml. 2. No hook effect was observed in this assay at cardiac troponin-I concentrations up to 10,000 ng/ml. 5. Recovery Various patient serum samples of known human cTnI levels were combined and assayed in duplicate. The mean recovery was 93.3%. 6. Linearity Four patient samples were serially diluted to determine linearity. The mean recovery was 101.7%. Diagnostic Automation Inc. also provides other ELISA Kits. For more information about elisa Kits, Rapid Tests, IFA Kits, CLIA Test Kits, or Serology tests, please see our website home page, or contact our Customer Service Representative at 818-591-3030. The detection level of Troponin I in this Troponin I ELISA Test kit is a minimal concentration of 1.0 ng/ml, and there is no cross-reactivity with human cardiac troponin T or skeletal troponin T or I.